Sabella Plank With Pad should be on the top of your list if you need a hard surface flooring that is waterproof, pet friendly, great for active families, anti microbial, air quality certified, and anti scratch. 2744 Sabella is an LVP with 4 sided micro bevel, and already has a pad attached for added comfort. Warrantied for residential and commercial. 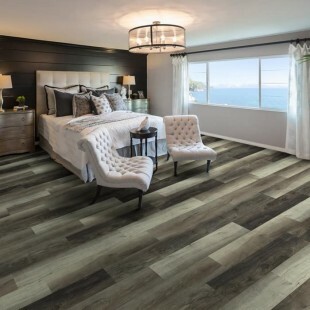 The purpose of Luxury Vinyl Plank is to give you the look and feel of a wood floor, but without the high maintenance and cost. Just like wood flooring, LVP's come in a variety of widths, and imitates the look and feel of natural wood almost perfectly. Each selection is protected by an innovative design that makes it a flooring option that you can count on for decades to come. A Sample Swatch is a 6"x6" or stock size of only one color. Make your choice by selecting a color above, then click "Add Sample to Cart." Price is $1.00 each. Real Wood Look – Hardwood flooring is great, but there are so many ways it can get damaged. LVP gets you the aesthetics you want without the maintenance hassle. Softer Feel – Vinyl may be a hard-surface material, but it offers a softer feel when standing on it. 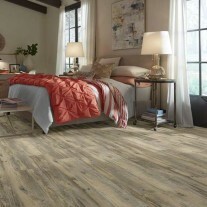 This is one reason why you see luxury vinyl flooring being used in almost every room of the house. Water Proof – Making it a favorable flooring even for kitchens, bathrooms, and washrooms. It is better at sealing against damage from water more than your other hard-surface flooring products. Direct Installation – Since vinyl plank can be installed directly, the installation process is quick, cost effective, and quite easy to do. Just make sure your subfloor is in good condition before installation. Easy Maintenance – LVP is easy to clean and takes little maintenance. With a routine sweeping and mopping, your floors are on their way to a long life of beauty and comfort. Let us know your needs, we will get your best price…If you haven’t received your pricing, be sure to contact us for a quote. We will give you the best price, and apply any current promotions. Our cash special promo, on our running line products range from FREE FREIGHT, free pad, or a percentage off. Promotions are given specific to product and quantity, so be sure and provide us with which product you will be ordering and the amount so that we can get you the best promotion available! If you need flooring, now is the time to buy. Our already low prices, plus our promotions will get you the lowest prices in today’s market. Must have your quote number to secure lowest pricing. The truth about shipping cost... When you purchase flooring from DaltonCarpet.com, we will find the best shipping rate based on contracts we have established with common carriers. In some areas of the country, this can be as little as $.45 a yard. Retailers simply build in your shipping costs. Why not know exactly what you're being charged? The first bit of advice is to get to know the person from which you will be purchasing. The cheapest is not always the best, value is our goal. Find someone whom you can trust and who understands flooring. Buying hard surface, or carpet should be a pleasant experience. Buying from someone who tries to sell you flooring that is not well suited to your needs will make it a miserable experience. At DaltonCarpet.com, we know flooring, it’s all we do and we've been doing it for over 30 years. Our job is selling flooring. Saving you money is our pleasure!